We feel the urge to publish this internal view of Syria:direct from the out-of-sight Turkish-Syrian border, that is further moved into the northern Syrian territory. Since the Turkish state is increasingly investing in both internal and external policies for the return of Syrian refugees, in addition to the EUropean border regime that is extra fortified via the externalization of controls even-beyond the neighboring Turkey, it is vital to keep an eye on the ongoing situation at the Northern Syria. Apparently, Northern Syria became a regional refugee accommodation center for the displaced Syrians, with Turkey’s effort to exert control over the area through various mechanisms. Therefore the region’s condition is a central determinant both for the responses of Syrian refugees in Turkey (be it from the region or not) to the incentives of return, and for the Syrians in Syria in considering their survival chances within the region or the options of further movement. Inauguration of a courthouse in a-Rai in September. Photo courtesy of the National Police and General Security Forces in a-Rai. AMMAN: When the governor of Turkey’s Kilis province arrived at the opening ceremony of a new courthouse in the northern Aleppo town of a-Rai last month, he was met by Turkish music blasting out of speakers and salutes from local Syrian police officers. 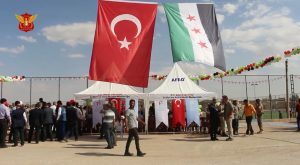 It was the governor, flanked by a handful of Turkish officials, who cut the red ribbon inaugurating one of the latest additions to northern Syria’s infrastructure of bilingual government institutions. In the background, garlands of alternating Turkish and Syrian revolutionary flags decorated the tents and pavilions set up for the occasion. Above the courthouse’s doorway, a large red sign read “Palace of Justice”—capitalized in yellow lettering, and in Turkish no less—with the Arabic translation just underneath it. These are the scattered signs of a way of life that Syrians in the north are still adjusting to. Ankara’s presence in northern Aleppo dates back to 2016 when the Turkish army, supported by rebel factions nominally operating under the umbrella of the Free Syrian Army (FSA), launched Operation Euphrates Shield to drive out hardline Islamic State (IS) militants from territories bordering Turkey. Turkish-backed forces would later brutally assert themselves over Afrin, then held by Kurdish-majority forces. Initially marketed as a series of offensives against external threats to Turkey, the country’s influence over this corner of northern Syria is now far from limited to military matters. While the images of Turkish flags and signs are not new, residents, rebels and local opposition officials suggest that Turkey’s role in northern Syria has gradually expanded from the security sector to encompass most aspects of political and civilian life—courts, schools and religious authorities, right down to the minutiae of service provision and civil registration. Even local councils—civilian administrative bodies that once answered directly to the Syrian opposition’s Interim Government—now operate under the authority of Turkish “walis” or governors in neighboring Turkish provinces. And while some civilians tell Syria Direct that they’re thankful for the stability that Turkish-backed authorities provide, they remain ambivalent about the impact of a growing Turkish presence over their lives—as well as the future of northern Syria. When Turkey launched Operation Euphrates Shield in 2016, Syrian rebel groups—backed by Turkish Special Forces and air support from the US-led coalition against IS—managed to capture the border city of Jarablus from IS within hours. Shortly after, Turkey announced plans for the reconstruction of Jarablus and put the city under direct supervision of the Turkish governor in Gaziantep, who has overseen restoration of municipal services, schools and local law enforcement. The governor would also appoint a new local council—apparently ignoring the existence of an opposition-affiliated government-in-exile, which claimed jurisdiction over local government bodies in northern Syria, based out of Gaziantep. Now, some two years later, the so-called “Jarablus Model” has been exported to other Turkish-occupied areas of northern Aleppo province—most recently in Afrin, after the Turkish army and Turkish-backed rebels launched Operation Olive Branch in January to oust the Kurdish-led People’s Protection Units (YPG) from the area. Meanwhile, residents in Afrin, Azaz and al-Bab describe Turkey as an almost omnipresent authority in northern Aleppo. A-Shami, like all other sources quoted in this reported, asked that his real name be withheld for fear of reprisals from Turkish authorities or Turkish-backed rebels. An elementary school exam certificate written in Turkish and Arabic. Photo by Abdelrahman Hussein. Local councils and public service providers in northern Aleppo formally operate under the umbrella of the Syrian Interim Government, a Gaziantep-based opposition system of government that took the place of the Syrian government in rebel-held areas across Syria. But in northern Aleppo, residents claim that the Syrian opposition authorities now have only nominal authority in the area. “Even the [Syrian Interim Government’s] Free Police don’t have control over the people here,” a-Shami tells Syria Direct, adding that residents usually go directly to the Turkish authorities with even the smallest problems that they might have. Despite Turkey’s intensifying presence in all levels of civilian life in northern Aleppo, things are not always running smoothly. Already struggling to accommodate 3.5 million refugees already on Turkish soil, and facing an ever-worsening economic crisis, Turkey’s promises of facilitating reconstruction, service provision and development to northern Aleppo can seem ambitious. Thousands of displaced Syrians in northern Syria meanwhile continue to struggle to access even the most basic services in camps administered by Turkish aid organizations, some of them state-affiliated. As recently as a few days ago teachers in al-Bab took to the streets in protests of their low salaries, which they say do not cover the expenses of a single week. Earlier this month, the teachers reportedly submitted an official complaint in Turkish to the Turkish authorities through the local council in al-Bab, alleging that their salaries were about half of the salaries of their Syrian peers on the other side of the Turkish border. Signs of discontent from residents are not always well-received, and residents say authorities have cracked down on expressions of opposition to the presence of Turkish military and civilian infrastructure in the area. In August, a doctor based in Al-Bab was arrested and sentenced to five months in prison, in addition to a fine of five thousand Turkish Lira (roughly $860)for publicly criticizing Turkish President Recep Tayyip Erdogan. A rebel spokesperson in northern Aleppo, speaking to Syria Direct on condition of anonymity for fear of reprisals from Turkish authorities, acknowledged that discussing the mechanics of Turkey’s presence in and around Aleppo can be risky. “This isn’t just sensitive, it could get me disappeared behind the sun,” he says, using an Arabic expression commonly used to describe someone vanished without a trace, often at the hands of repressive state security services. Although arrests are rarely carried out by Turkish forces themselves, he adds, Syrian rebel commanders often do so in order to seek the favor of Turkish commanders. A square in Afrin named after Turkey’s President Recep Tayyip Erdogan. Photo courtesy of Bawaba Hallab. Nowhere has born the brunt of Turkish authority more than Afrin, a traditionally Kurdish-majority city in Aleppo province that became the central focus of Turkey’s Operation Olive Branch earlier this year. Since the conclusion of that offensive, in which the Kurdish-led YPG were ousted from Afrin city and forced into the outlying countryside, a Turkish-backed local council has consistently struggled to assert its authority over rebel factions who dominate the city and its suburbs. Local rebel factions including the Sultan Murad Division, Firqa 55, al-Jabha a-Shamiya, Failaq a-Sham and Ahrar a-Sharqiya have been accused of carrying out arbitrary arrests, looting and expropriations of property without the consent of the council—let alone local civilians. Human rights group Amnesty International has accused the Turkish armed forces of “turning a blind eye” to what it calls the “serious human rights violations” of rebel factions under Turkish command. And while the Kurdish-led YPG has been forced out since Turkish-backed rebels took over, the group’s insurgency campaign waged from the countryside continues to threaten stability within Afrin itself. Still, residents in northern Syria say it is preferable to what they see as a possible alternative: the kind of rebel infighting that has rocked other rebel-held areas across Syria—not least neighboring Idlib province. The fate of neighboring rebel-held Idlib province hangs in the balance following a Russian- and Turkish-brokered deal last month, ostensibly meant to avert an all-out pro-government offensive there. However, analysts—divided on the finer details of Turkey’s presence in the north—have suggested that the Turkish president may be eyeing a long-term hold over areas of Aleppo province. While some draw parallels with the Turkish province Hatay—a semi-autonomous region of Syria previously known as Iskenderun, that was annexed by Turkey in 1939—analysts appear to agree that Turkey’s presence in northern Aleppo will most likely be temporary. Elizabeth Teoman, a researcher with the US-based Institute for the Study of War who specializes in Turkish politics, is also hesitant to draw such hard and fast conclusions about Turkey’s long-term goals in the region. Yezid Sayigh, senior fellow at Carnegie’s Middle East Center in Beirut, likewise suggests that any Turkish presence in northern Aleppo will be temporary—but that it has specific purposes to be served in the meantime. The YPG’s presence along the Syrian-Turkish border has long been perceived as a threat by Turkey, given their ideological ties to the Kurdistan Workers Party (PKK), a leftist Kurdish political and paramilitary group that for decades has been fighting for secession of Kurdish populated areas from Turkey. Even so, people now living in this corner of Syria are nervously eyeing what an expanding Turkish presence around Aleppo province could mean for them—anxious for the present but ambivalent about the future. Hussein, the unemployed father of two who was displaced from Ghouta earlier this year, feels torn. “It’s complex,” he says, weighing up the short and long-term benefits. With additional reporting by Abdullah al-Hasan and Mareem al-Hourani. This article was originally published by Syria:direct.